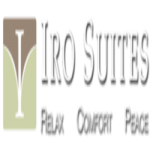 Welcome to Iro Suites in Andros, a small luxury hotel that everything has been particularly designed by personal care of Iro and Dino and is harmonized with nature combining wood, stone and modern style of living. Our picturesque studios and suites are amphitheatrically built at the foot of a hill with great view to the above greenery mountain and sea. Iro Suites only 1 km far from cosmopolitan Chora and sea, will captivate all visitors with its beautiful simplicity and make them enjoy pleasant and relaxing atmosphere. “Feel like your home” is our purpose!